Portable conductivity meter for field measurements. The Pinnacle Chek-Mite Duo-60 Conductivity Meters provide a whole new level of performance in an inexpensive line of handheld conductivity meters. This dual-purpose conductivity meter measures pH and conductivity using independent electrodes. Featuring advanced microprocessor technology, Chek-Mite Conductivity Meters offer automatic calibration (to values of 4, 7, or 10.01). Sealed components and casing are waterproof, and enable the conductivity meters to float when dropped in water. 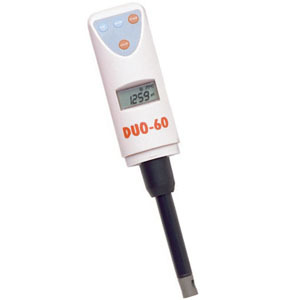 With automatic calibration, automatic endpoint determination, and automatic temperature compensation (ATC), the Chek-Mite DUO-60 Conductivity Meters offer high-level performance at a low price. This line of conductivity meters comes with a six-month warranty. Includes 4, 7, and 10 pH buffers (500mL). Vario Cond Temperature Conductivity Meter TetraCon® V Kit Includes: Vario Cond, mobile case, TetraCon® V cell, and KCl solution. Includes meter, probe, case & accessories. Conductivity meter with universal AC power supply. Specify conductivity sensor range when ordering: 0-5,000, 0-10,000, 0-20,000 Micro Siemens (micro mhos).